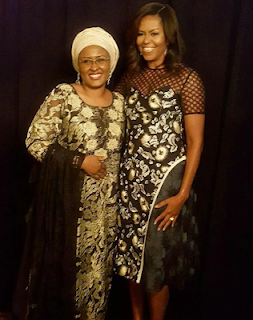 The wife of Nigerian President, Hajia Aisha Buhari, on Monday evening met with the First Lady of the United States, FLOTUS, Michelle Obama, in New York, during the wife of the United States’ Broadway event to help educate girls. Mrs Buhari took to her Twitter handle, @aishambuhari, to express her pleasure in meeting Michelle Obama about girl empowerment. “It was a pleasure meeting @FLOTUS Michelle Obama earlier this evening at her broadway event about girl empowerment,” she wrote on Twitter.